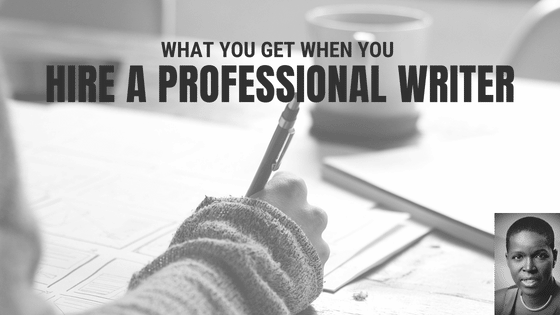 What exactly do you get when you hire a professional writer? I’ve been thinking about this, especially since someone I worked with asked me about my writing process. And here are more details on the process a professional writer goes through. Get a working title. This helps me to have a focus for the article or blog post. If it’s a topic I already know, such as email marketing, content marketing, social media, SEO, or analytics, I’ll make some notes about what needs to be included. Think about a story or stories that will help to bring the topic to life. Storytelling is a great way to introduce any topic, and it makes your business more relatable. Draft an outline, including provisional subheadings. This gives the article structure and direction. SEO – I’ll think about focus keywords. A good place to start is to check out Google suggested search terms and use LSI Graph. SEO – research topics in Google and elsewhere to get a feel for what’s been done, paying particular attention to recent content and the “people also asked” section. When you know what people are looking for, it helps you make decisions about what to include and exclude in a piece of content. For the same reason, I’ll check out topic-related questions on AnswerthePublic. Find charts and quotes related to the topic. Including real data and research is always a plus. Revisit my outline to see how I can improve on or be different from what’s out there. Start brainstorming content titles based on the new angle, if I’ve changed it as a result of the research. Use CoSchedule Headline Analyzer to find the most effective titles. This is a great, free tool. Revisit my outline and add any new information. Think about the conclusion – what the reader will gain from reading the article. Let the first draft sit for a couple of days, then reread to see if I need to tweak anything. Sometimes I’ll do this twice. Make sure the article answers readers’ questions. Finalize the title and conclusion based on what I’ve actually written. Add a call to action to read more content or promote a resource. Proofread one more time, to check for typos and other errors. Edit images and screenshots if needed. Submit the work to my client. So that’s what you get when you hire me as your professional writer. Want to learn more? Check out my business values and examples of my work.